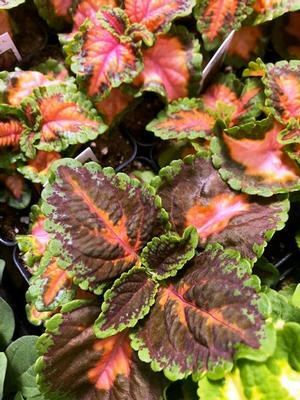 The Coral Sunrise Coleus is a beautiful blend of pinks with a touch of vibrant green around the edges of its nearly heart-shaped leaves. This is a lovely addition to any landscape. The Coleus has nice dense foliage with a mounding, upright habit. Coleus prefers the shade, but can handle the heat if in partial shade to shade. It is a favorite with landscapers and homeowners. Foliage is a great accent to all shade gardens and landscape. The wide range of colors are so varied that just mixing different Coleus together is striking. Most Wizard Coleus prefer partial shade to shade, however; the Coral Sunrise Wizard Coleus can handle more sun, and grows best in moist but well drained soil.